Once I had a supervisor who used to call me in and do her e-mail while I sat there. She would check it and respond; take phone calls; talk about the weather, and her home, and her weekend; and once in a while give me a task or two. Sometimes she would say, "I have to go to the restroom," and would say something like "let's go." I was young and inexperienced and fearful. So I went. Fortunately all I had to do was wait outside, but it was still pretty humiliating. She talked and talked the whole time, and I had to nod and go along with it like it was totally normal. I share this not for gross-out value but to talk about one aspect of the experience that stands out for me. At the time, I did not have the language to name what I was going through. So although I knew there was something wrong, I couldn't really confront the situation. Not sitting down, like this (Au Bon Pain). Starbucks does that too, except worse. If you don't care about the item you are selling, stop selling it. People knowledgeable about branding tend to think that the case for branding is self-evident. The best brand strategists are able to talk to non-brand people who are completely unconvinced or even hostile to the concept of branding. In the end you can have the best ideas in the world. But those ideas are actually implemented through people. It's so hard to write about Memorial Day and other celebrations. Either you sound like everybody else or you seem like you're trying to exploit something for your own gain. Hopefully this blog doesn't do either. For me this holiday brings five reflections. 3. Appreciation for our military families, whose sacrifice is quieter but no less real. The wish that men could be given more permission to be "soft," fair and human rather than always "macho" without being stigmatized. Especially because when they come home, the post-traumatic disorder leads often to family turbulence and domestic violence. At Nike the other day I saw the lines were out the wazoo. It made me wonder what would happen if something bad happened G-d forbid and we were lining up for medical supplies rather than 30% off sneakers. Since I can't handle that kind of reality all that well my thoughts turned of course to marketing. Which leads to this short post clarifying and classifying the variations of scarcity branding. 1. Most people don't understand when to use scarcity vs. saturation. Basically, you saturate the market to gain awareness and credibility - people "know" you so they trust you as a vendor. You make a product scarce when you have the promise of developing sufficient foothold that you can simply charge more per item. 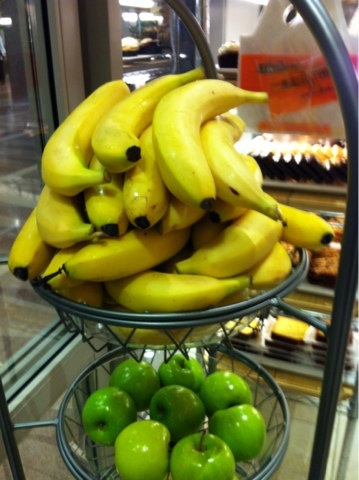 Scarcity is a quality strategy, saturation goes to volume. 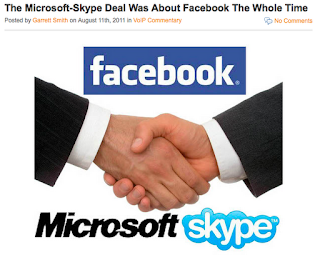 Image: Screenshot of blog post by Garrett Smith for voipsupply.com (blog), August 11, 2011, "The Microsoft-Skype Deal Was About Facebook The Whole Time." Apparently other people are thinking the same thing that I am: Combine them. Except they're missing one crucial element - use the combination to turn the workplace social. Wrong approach: Figure things out about people and put customized ads in front of them. The workplace is the great unexploited center of value and profit. It can be leveraged much more fully to bring employees together to generate ideas, work more closely on projects, and align corporate culture for greater productivity, engagement, stability - RESULTS. Recently somebody asked me why I spend so much time publicizing issues like workplace bullying, abuse, human trafficking, feminism, abuses in organized religion, and the importance of outing and prosecuting child molesters. I understood the subtext of the question: "You must have been a victim, right?" As if nobody in their right mind would care about this type of thing unless they had been personally tortured. It is true that people who take a stand can become victims themselves. Remember Judy Blume's classic young adult book, Blubber? A college friend was a film student at Tisch School for the Arts at NYU. I vividly remember her practicing her shots, spending hours positioning a rose on a stool with a white sheet draped behind it. Then taking picture after picture. Went to Pennsylvania once, and spent the weekend with her family. They had some kites, or flags, or something like that affixed to the ceilings as well. I stood there in joy and wonder, thinking of the heavy books and heavy framed pictures in my house in New Jersey. Airy in her house, heavy in my own. I never wanted to be religious like my parents were. But I couldn’t admit it then. The other day I decided it was time to ingest something green again. I have been eating largely white and brown foods for the past week and am starting to feel pale. Normally I would love to go to Chop't and get a salad but there are two problems with that plan. So I went to Au Bon Pain and glanced over the soup. I don't know, that stuff they call "12-vegetable soup" - is it really as healthy as it sounds? Tastes good, but I was after fresh. And I don't count starchy vegetables as healthy. The new salad bar at Au Bon Pain is not as appealing as Chop'ts is but it was empty. I walk up to the counter and look at what's behind the glass. Same kind of food as Chop't, I guess. Not as good. Spinach is safe. So I say to the person who serves the food, "I'd like a salad please." 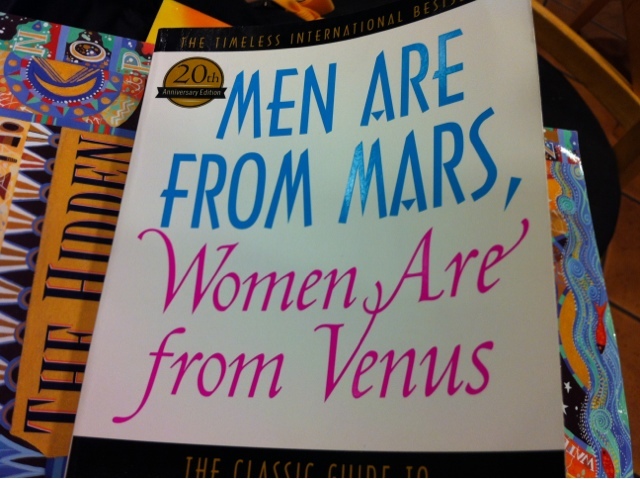 You know how men tend to clap their hands over their ears when women start lecturing them about feminism? "The popular dismantling of entrenched feminist stereotypes began, perhaps, not with the feminist movement itself, but in comedy....on “The Daily Show”: 'What’s the difference between a fertilized egg, a corporation and a woman? One of them isn’t considered a person in Oklahoma.'" So I stopped to get gas and as usual could not maneuver the car properly to the pump. After a tortuous 15-minute thing where I turned the wheel this way and that and reversed about twenty thousand times, finally we landed. As I looked up to find the proper pump from among regular, unleaded and diesel (why is ordinary life so confusing?) I see that a bunch of high school kids are running a car wash at the station. There was one car getting a wash. Eight kids surrounded it, wiping and wiping without much sign of success. Another two stood out on the street, waving "Get A Carwash" signs sort of aimlessly. What were they doing out there? I guess just having fun, and the car wash was an excuse. A few miles later we passed another place that really did car washes. Like, for a living. I was stopped at a red light and watched. Three or four people furiously scrubbed a car inside and out. They made that gray Kia look gorgeous. This seems to be the week for stories. So be it. A long time ago there was a teacher who creeped me out. No abuse, fortunately. But still, something wasn't right. I told my parents and my dad had a secret conversation with the school board. He had done a little digging and sources told him that the rabbi was in fact a predator. My dad is Eastern European in manner and dress and they laughed him off. Then my mother went into action. You have to understand that my mother is quiet, short, and normally extremely shy. But on that quiet sunny Friday she drive her little old car at top speed to my school. I watched in awe and fear. She harrumphed up to the curb. She had on old jeans and a T-shirt like always. She is the polar opposite of my dad, 100 percent Middle America. My mother stomped up the broken brick walkway. She flung open the heavy metal door. She raced through the hallway and up the rickety stairs. I couldn't keep up with her. I felt like I was going to fall.